Seventeenth century philosopher and scientist René Descartes studied the pineal gland and its impact on our lives, believing that it was our link between the spiritual and physical world. 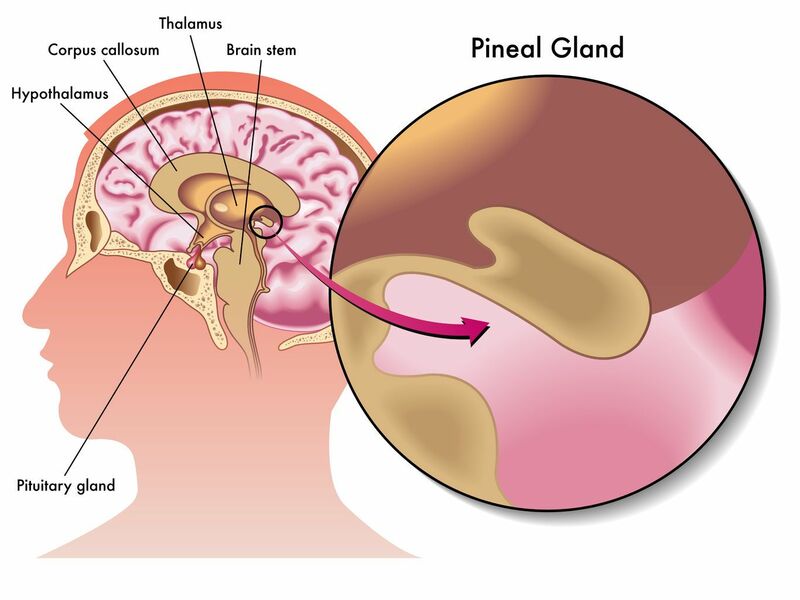 Located in the center of our brain, the size of a piece of rice, with the shape of a pinecone, is the pineal gland, which is directly connected with our body’s awareness of light. It regulates our daily circadian rhythms, our sleep-wake patterns, our hormone levels, stress levels, and how we perform physically throughout the day. Essentially, it controls how we feel and think for the duration of our lives. If you imagine the shape of a pinecone, with its many layers, you will see a pattern. This pattern, which is called the Fibonacci Sequence, is also seen in other parts of nature, like that of a hurricane, or that of a spiral galaxy. This sequence is not only unique to nature but has significant importance in that it allows for uniform distribution. The pineal gland has been thought of as a sacred symbol over time in many diverse cultures and is always represented in this shape. Egyptian staff of Osiris includes two serpents that intertwine up to meet at the top of a pinecone. Buddhists shape their hair up in the shape of a pinecone on the top of their head, reflecting on the power of the pineal gland. In ancient Assyrian carvings, a four-winged God-like creature is depicted using a pinecone to pollinate the Tree of Life. Today, the pineal gland is associated with the sixth chakra, where ethereal energy is at its highest and is most connected to the spiritual world. What Do You Need to Do to Activate the Gland? Natural light is such a crucial regulator to the activation of the gland. Many would agree that the long days of winter with little or no sun influence the way we feel, and many are often plagued by Seasonal Affective Disorder (SAD). By spending some time in the sun, we stimulate the mind and the gland produces serotonin, one of the key chemicals that is responsible for our mood and energy levels. Nighttime is when melatonin is produced and is crucial for our sleep and wake cycle, it comes directly from our pineal gland. In order for the gland to produce this crucial natural substance, your body needs darkness. If the first two are pretty obvious to you, then maybe the next two are not as much, but they too can provide a big boost to your moods and energy levels. When you meditate your body releases bioelectric energy into the body, much in the same way from the release of serotonin and melatonin; your body reacts to the release of this bioelectric energy in a positive manner. Some essential oils are believed to help stimulate the gland: cedarwood, frankincense, and sandalwood can provide the right therapeutic properties needed if applied in the correct manner. They can be orally consumed, by placing the oil on the roof of the mouth or under the tongue, inhaled, or topically applied to either the middle of the eyebrows (where the Third Eye Chakra is located) or the crown and back of the head. Take time to remember the important gland that we so often forget. If you find yourself feeling out of sorts, remember what is needed for it to work efficiently; plenty of sunlight, a dark room to sleep in, and some meditation with some essential oils are all ways that you can help regulate how you feel on a daily basis. How Can Essential Oils Help Your Yoga Practice?